It was a remarkably different outcome in weather from the previous day if you double-backed from the Festival of Miles held in St. Louis, MO. There it was a balmy 87-88 degrees when meet officials open the gates. At St. Ignatius HS, it was 58 degrees and dropping. There were many patrons with hoodies and gloves on ready to cheer on their favorite runners. It took 10 sections of mile races before the National Anthem was introduced. After the formalities were exchanged it was time to get serious. 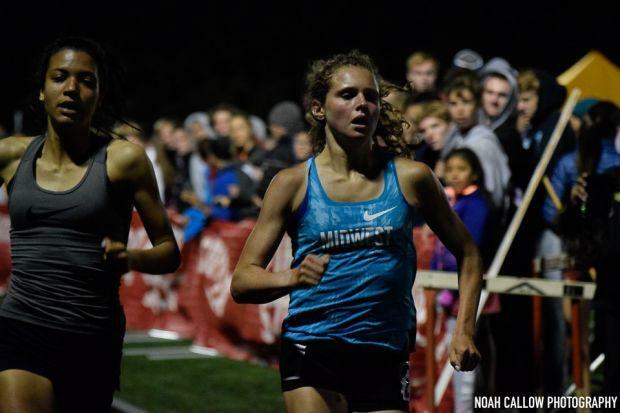 The set up to the "battle" between Katelynne Hart and Enyaeva Michelin were the high school girls elite races. The key section two featured a mix of comers and goers, emerging ones, and something to get excited about. Future Naperville North runner Campbell Petersen is finishing up her outstanding freshman campaign as a Dunlap HS product. In the process, Petersen battled several foes such as Audrey Ernst of St. Charles North, Corinna Pena of Neuqua Valley, and top middle-schooler from Latin of Chicago Ava Parekh. Petersen pulled away from the resistance on the final lap to run a personal best of 4:59.52 (4:58.05). Pena and Parekh took second and third respectively. Once again the main event CARA Elite Women's Mile got off to a fast start as Hart and Michelin ran hip to hip without the services of a rabbit. They wouldn't need one with splits of 67, and 2:19 for yards. The bell hit 3:33 similar to the state championship a few weeks prior. Hart had a step on Michelin again and from a mental standpoint, the edge. Michelin tried to surge but Hart powered as well and with just a curve left went into full speed mode and won in a blazing fast 4:44.63. Along with the official 1600m clocking of 4:43.07, Hart has the fastest ever times run by an Illinois girl. Not to be entirely outdone were the impressive 4:46.29/4:44.66 marks by Michelin. She rates #3 all-time in the 1600m. Chicago Francis Parker senior Jack McNabola won the first section in a personal best 4:21.24. The soon to be University of Notre Dame product was pretty content with his performance and is looking forward to the next level. Section two turned was more of a close shootout in which Tommy Brady of Maine South won the battle. 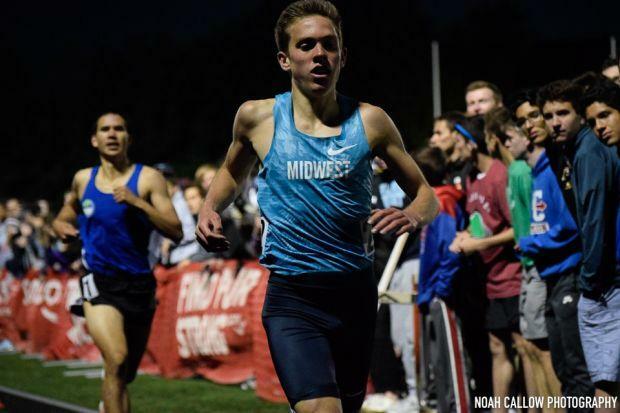 The junior clocked 4:21.94 to hold off junior Jadon Conroy of Huntley and senior Jack Roberts of Downers Grove North who ran 4:22.01 and 4:22.91. The big race of the elite section three featured Lyons Twp. senior Danny Kilrea, Naperville Central junior Thomas Shilgalis, Libertyville senior Alex Tam, Neuqua Valley junior Zach Kinne, and Jacobs junior Zach Albrecht. After a tight first half, Kilrea and Shilgalis got a few steps on the field. Shilgalis had previously run about 24 hours before at the Festival of Miles placing second in the 800m with a state-leading 1:51.81. So how would he do in the final stages? Running side by side with Kilrea, Shilgalis tried his 5th gear but was unable to power past the distance king of Illinois. Instead, it was Kilrea who motored home for the win in 4:13.52. Shilgalis ran 4:14.54 to earn the runner-up prize. The sub-4:00 mile never really materialized in the CARA Men's Mile. The pace was dogged with a 3:01 3/4 mile clocking. The winner Taylor FloydMews of Bradley University won in 4:03.86. He powered by former Warren Gurnee HS standout now of Brown University Martin Martinez in the final steps. Martinez clocked 4:03.95. Sandburg senior Dylan Jacobs finished 9th in 4:14.77.